Lake Tahoe has been snow free since the October 28th storm dumped 10 to 18 inches in the high country and 6 inches at lake level. However, the overnight lows have been cold enough for the resorts to make snow most of the days since. A storm window is opening this Monday through Wednesday, so we may get a little more natural snow for some early opening resorts. For the most part, opening day will mean restricted skiing on machine made snow. Boreal has been open with their shortest lift running for more than a week now. There just isn’t enough snow yet. Let’s hope for better things to come. Heavenly Lake Tahoe: November 22. Mt. Rose: November 22. now Nov. 27th. Tahoe Cross Country Ski Area: November 29. 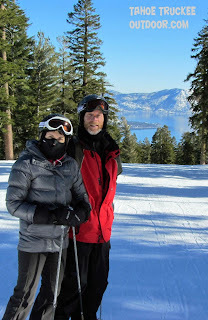 Tahoe Donner Ski Area: December 13.